﻿Coach ﻿Flemming ﻿is ﻿a ﻿certified ﻿USAW ﻿Regional ﻿Coach, ﻿and ﻿has ﻿level ﻿I ﻿teaching ﻿certification. 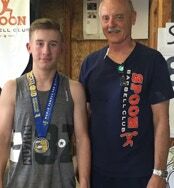 ﻿Coach ﻿of ﻿the ﻿Spoon ﻿Barbell ﻿Club ﻿since ﻿1975, ﻿coach ﻿Flemming ﻿has ﻿helped ﻿numerous ﻿lifters ﻿reach ﻿national ﻿and ﻿international ﻿levels ﻿in ﻿weightlifting. ﻿Most ﻿notable ﻿was ﻿Chad ﻿Vaughn ﻿who ﻿qualified ﻿for ﻿both ﻿the ﻿2004 ﻿and ﻿2008 ﻿Olympic ﻿Games. ﻿Coach ﻿Flemming ﻿has ﻿been ﻿involved ﻿with ﻿symposiums ﻿which ﻿included ﻿German ﻿head ﻿and ﻿assistant ﻿coaches, ﻿and ﻿was ﻿coach ﻿of ﻿the ﻿men’s ﻿U16 ﻿team ﻿that ﻿competed ﻿in ﻿Peru. ﻿Other ﻿lifters ﻿coach ﻿Flemming ﻿has ﻿or ﻿is ﻿currently ﻿working ﻿with ﻿are ﻿Spencer ﻿Arnold, ﻿American ﻿Open ﻿Weightlifting ﻿Champion ﻿in ﻿2012, ﻿master ﻿lifter ﻿James ﻿Aftosmis ﻿(M45, ﻿77k), ﻿National ﻿Masters ﻿Champion ﻿in ﻿2013, ﻿and ﻿Melissa ﻿Knourek ﻿(W40, ﻿63k), ﻿2013 ﻿National ﻿Masters ﻿Champion, ﻿and ﻿2013 ﻿Pan ﻿Am ﻿Masters ﻿Champion, ﻿as ﻿well ﻿as ﻿Bobby ﻿Sirkis ﻿who ﻿is ﻿a ﻿lifter ﻿and ﻿meet ﻿promoter ﻿extraordinaire. ﻿Coach ﻿Flemming ﻿was ﻿an ﻿outstanding ﻿lifter ﻿in ﻿the ﻿1970’s ﻿and ﻿helped ﻿the ﻿Spoon ﻿Barbell ﻿Cub ﻿place ﻿2nd ﻿at ﻿the ﻿Senior ﻿Nationals ﻿in ﻿1977, ﻿by ﻿placing ﻿6th ﻿in ﻿a ﻿highly ﻿contested ﻿field ﻿of ﻿competitors. ﻿Spoon ﻿came ﻿very ﻿close ﻿to ﻿dethroning ﻿the ﻿then ﻿famous ﻿York ﻿Barbell ﻿Club ﻿out ﻿of ﻿the ﻿team ﻿trophy. Richard took me under his wing and kept me going after high school. He told me I was capable of becoming an elite lifter, and believed in me when I did not believe in myself. Even though I thought he was crazy, I followed, and this is where that route lead; WHAT a journey it&apos;s been! If you are now one of my students, you can thank this man for most of the torture you get to endure! Thanks again Richard.